I hope you had a fabulous holiday season and are enjoying the start of the New Year! For my friends in the northern part of the U.S., it’s a good time to be indoors and painting given the frigid temperatures outside. 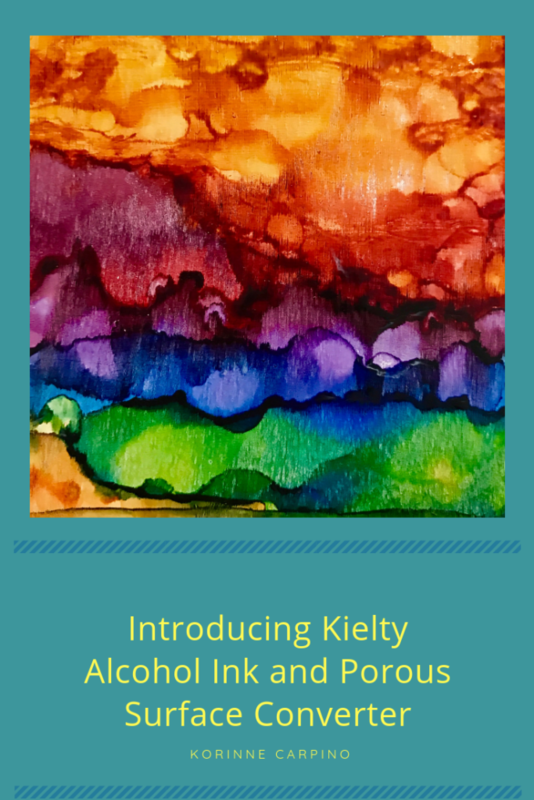 In early December, I came across a YouTube video by Myriam’s Nature introducing Kielty Inks from Ireland. It certainly peaked my interest. The colors looked rich, and the company had developed products that were advertised as non-toxic. I quickly went to the website to find the company offers: inks; a retarding mixative to extend the working time of the ink; layer solution that allowed for inks to be layered and not mix together; blending solution, and a porous surface converter. Of course, I had to try most of it and pre-ordered an ink set and some porous surface converter. This is a small company, and I did have to wait patiently until mid-January for the entire kit to be in stock and mailed. Whoa, once it was mailed, the inks arrived in three days! Now, the company is based in Dublin, Ireland, so the shipping fee is hefty unless you order over, I think, $126.00 and there is a minimum order of $57.44 USD. For my friends in the UK, Ireland or elsewhere in Europe, this ink may be less expensive than shipping from the US. And, these inks are more expensive than inks produced in the US. Open to experimenting with inks, despite the cost, I had to have these. So now to experiment and see how I can use these products in my artwork. I am starting a project to make 3×3 cradled panel paintings and decided that instead of painting on yupo paper and adhering that to the panel, I would simply seal and paint the wood and then use the porous surface converter. I did experiment a bit and decided the two coats of the porous surface converter are needed. With one coat, the ink seemed to soak into the panel a bit, and I didn’t want that effect. flow more freely. Even with this layer, I found that the inks do not move as easily as they do on yupo. But this is all about trying new substrates and ways to paint! I am so happy to share my learning with you that I made a short video demonstration. CLICK HERE to see the video and learn more! As I experiment and learn more about all of the Kielty products, I will pass on learning to you! The shipping is normally about $27 which in fairness is not that hefty, people need to remember that these items are coming from Ireland AND are flammable liquids. Free shipping is on orders over €150. If people are in remote areas then UPS charge a surcharge which effectively doubles the shipping price. This is not something I have any control over, I am trying to work with UPS to get shipping prices down and to expedite customs processing times. It has also come to my attention that some people are being charged more money at the door for shipping as “I underestimated” the shipping weight. This is not correct and is something that I am disputing with UPS. If this happens to you send me a copy of the document they give you advising you of the charges and I will deal with it. I have covered way more in surcharged shipping than you guys can imagine. UPS have charged me thousands in surcharges which I have covered. I am working out a deal with DHL and their shipping system will be plugged directly into my site, so shipping charges will be accurate. Regarding the price of my ink, I have found that many outlets charge about $6 for a bottle or other brands. Mine translate to be about $6.30, as my inks are made with pharmaceutical grade solvents with next to no toxicity (unless you drink loads of it) the very marginal extra expense is well worth it given your exposure to acutely toxic ingredients from other brands. The softer the wood the more coats are needed though you should seldom need more than 2. If the wood has a very rough or fibrous grain then sanding after the first coat might give you better results, then apply the second. On wood you may need to give drying a few hours (your applying water to wood remember). If you are having a problem and keep it to yourself rather than telling me then I can’t assist you. My products have never been seen before by AI artists. I have not copied what other manufacturers have done, I have turned the entire formation of AI on its head. So don’t expect to apply everything you know from other brands to my inks. They are a whole new Irish animal. I am a very approachable guy and can be easily contacted through the website! So please do even if just to say hi, I will help in anyway I can. Thank you Daryl for this helpful information and for your caring and support of alcohol ink artists!